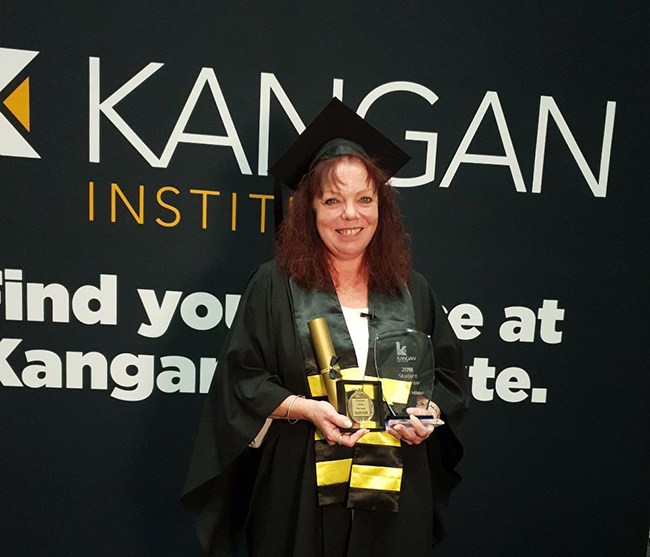 Kangan Institute has named community services and justice graduate Rachael Hilder its 2018 Student of the Year at the Class of 2018 Graduation and Awards Ceremony held last night. More than 200 graduates from Broadmeadows, Docklands, Richmond, Essendon and Moonee Ponds campuses attended the ceremony, with 11 awards presented to the cohort’s top-achievers. Ms. Hilder, who accomplished diplomas in community services and justice in 18 months, received $1,000 from sponsor ANZ Bank as part of the Student of the Year Award. The 48-year-old’s Kangan Institute journey began with a decision to pursue a career of her own following years as a primary carer and parent. Class of 2018 Student of the Year Rachael Hilder. “I’d always worked hours around my children and I had to quit two part-time jobs to return to study,” she said. Currently employed as a full-time correctional officer, Ms. Hilder highlights the role that TAFE played in transforming her life. “I’d like to thank Kangan Institute and all the staff at community services, justice and in administration,” she said. “When I first started I didn’t even know how to do most of the things on the computer. It was only due to the dedication of the staff and their patience I was able to actually get through. “I utilise all of the skills that I learnt through my community services diploma and my justice diploma in my day-to-day role. Kangan Institute’s interim CEO Phill Murphy congratulated all graduates and award winners for their achievements. “On behalf of Kangan Institute I’d like to congratulate all the graduates and award winners for their successes. Their achievements highlight the significance of vocational education and training in transforming lives, shaping communities and providing value to industry,” he said.